means the Province of Manitoba south and east of Zone No. 1B, and south of the line that includes PR 272 (Duck Bay), going easterly to include PR 513 (Dauphin River) and the northern tip of Black Island, following the eastern shore of Lake Winnipeg to the north shore of the Winnipeg River, easterly along the north shore of the Winnipeg River to PR304, and easterly to the Ontario boundary. means the Province of Manitoba south of the line that includes PTH 77, going easterly to include PR 483 (Pelican Rapids) and then going southerly to Cowan and south-easterly to Ethelbert to include PTH 10 and PR 367, going southerly to the RMNP boundary, going westerly and then southerly along the RMNP boundary, and westerly to the Saskatchewan boundary to include PR 482 and PR 549 (Shellmouth). 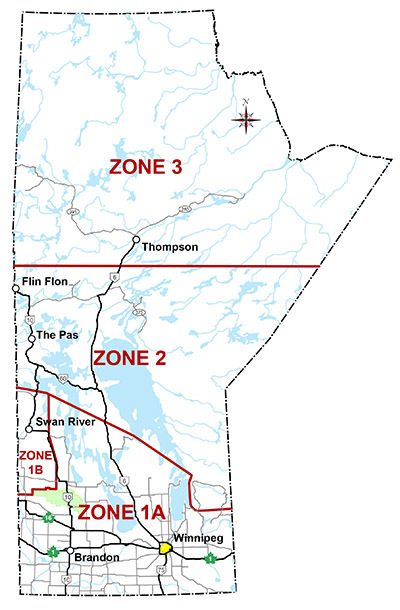 means the Province of Manitoba north of Zone 1A and 1B, and south of the line that includes Sherridon Road (Sherridon), going easterly to include PR 393, Wabowden Access Road (Wabowden) and Sipiwesk Lake Access Road, and easterly to the Ontario boundary. means the Province of Manitoba north of Zone 2. To see roadway detail, please visit the official Manitoba Highway Map. Note that spring road restrictions are not defined on that map. For detail on the spring road restrictions, please visit the Spring Road Restrictions Order, SRR Maps or Summary of Changes.